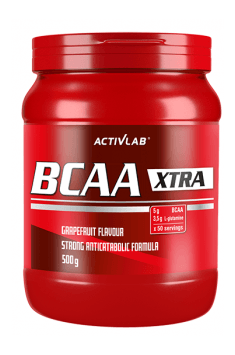 Activlab BCAA Xtra is a dietary supplement combining three branched-chain amino acids (L-leucine, L-valine, and L-isoleucine), additionally enriched with the amino acid L-glutamine. L-Leucine – gym fans probably know this amino acid the best, as they might be familiar with the term “leucine threshold”. It determines what amount of protein delivered with food will increase L-leucine levels. A higher concentration of the amino acid in the blood informs the organism to begin regenerative processes and increase muscle protein synthesis. That is because it stimulates the protein mTOR, which codes the process of muscle protein synthesis in the human organism. Adding L-leucine even to a high-protein meal stimulates anabolic processes. That is why in BCAA XTRA, L-Leucine was used in the ratio of 2:1:1 with L-isoleucine and L-valine for even better MPS stimulation. L-Leucine helps muscles to uptake glucose. By stimulating insulin, it provides working muscles with glucose and amino acids. Thanks to that, it can reduce fatigue and muscle soreness as well as improve their regeneration. Another amino acid found in BCAA is L-isoleucine. It is an isomer of the above-described amino acid. L-Isoleucine is responsible for increasing glucose uptake in muscles. As a result, it is possible to carry out even more intensive training and regenerate faster. L-Isoleucine protects muscles from breakdown, which is possible thanks to its ability to reduce gluconeogenesis. In other words, it does not let the body break amino acids down to sugars in order to obtain energy from them. L-Isoleucine deficiencies can result in muscle twitching and general fatigue, as it has an important role in glucose uptake. L-Valine is the last one of the big three of BCAA. Similarly to the other two amino acids, it is responsible for stimulating the synthesis of muscle glycogen. Moreover, it supports muscle growth by stimulating muscle protein synthesis and tissue regeneration. L-Valine is also responsible for proper glucose metabolism by activating insulin. It has been known for a long time that insulin is an anabolic hormone that provides muscle cells with amino acids and sugars. The amino acid also helps to inhibit the activity of tryptophan in the brain. Tryptophan is a precursor of the most well-known hormone, serotonin, responsible for relaxation and well-being. Consequently, supplementation with L-valine helps to fight fatigue and maintain alertness. The combination of the three amino acid can additionally support the utilisation of fatty tissue. That is probably possible because they protect muscle glycogen and burn fatty acids, making weight loss easier. L-Glutamine support the regeneration of the organism after intensive workout, which means it can reduce delayed onset muscle soreness (DOMS), thanks to which it is possible to go back to training sooner. Moreover, it has been demonstrated that administering L-glutamine with carbohydrates after workout speeds up glycogen resynthesis in muscles. Supplementation with L-glutamine also helps with protein management in the organism, thanks to which we can maintain a positive nitrogen balance and remove toxic excess ammonia. Along with branched-chain amino acids, L-glutamine prevents catabolism, that is muscle breakdown. The addition of L-glutamine helps to maintain proper BCAA levels in blood, which is desired both for regeneration and the process of muscle mass development. Another interesting fact is that the use of only 2 g of L-glutamine after workout increases the level of growth hormone in the plasma. The hormone stimulates regenerative processes and muscle protein synthesis (MPS). To sum up, Activlab BCAA Xtra is an optimal formula of amino acids with pleiotropic activity and multiple mechanisms that satisfy a number of the body’s needs. For those who want to gain muscle mass, the benefits are: stimulated anabolic processes and improved regeneration. On the other hand, those who prefer long-lasting workout will enjoy: reduced and delayed tiredness, protection of muscles in energy-producing processes, or faster restoration of glycogen reserves. Dobre aminokwasy za dobrą cenę,polecam! cena-ilosc rewelacja! pytanie tylko dlaczego inne bcaa w ilosci 500g sa drozsze od tego? Tanio, dobre w smaku i zawartosc tez jest spoko. b.db. Smak Gruszka, jedynie pachnie gruszka. Nic poza tym! Gorzkie w smaku. Produkt w bezkonkurencyjnej cenie :-) Rozpuszcza się bez problemu, smak w porządku (troche sztuczny) i minusem jest brak miarki w środku. Ale tak czy inaczej produkt spełnia swoje zadanie doskonale i w tej cenie jest znakomitym wyborem. Chyba najsmaczniejsze bcaa jakie pilem.. stosuje je od 2 lat i nie mam zamiaru przestac. One portion of 10 g 30 minutes before training and 10 g immediately after training. One portion of 10 g before meal. When used regularly, the preparation visibly reduces and delays the feeling of tiredness, allowing you to train for longer and more efficiently. You can limit the use of the preparation to training days only, as that is when it exhibits the most powerful activity and can prove sufficient. Acidity regulators: citric acid and sodium citrate, aroma, sweetener E950, coloring: E104 (lemon flavor and orange), E110 (grapefruit and orange flavor), E124 (grapefruit and cherry flavor).